http://www.designsoftheyear.com/A2B’s ‘Obree’ e-bike wins the Design Museum’s public vote! says Norbert Haller, A2B’s designer, as the Obree wins Designs of the Year Award first round online public vote by 79%! In the British Museum’s Designs of the Year Award online head-to-head, where the public vote for one of two transportation award nominees, A2B’s Obree wins its category. Norbert Haller, designer of A2B’s e-bikes, talks about A2B’s Obree design award nomination, what inspires him and the future for e-bikes. 1.Norbert, how do you feel about the Obree being nominated for the Design Museum London, ‘Designs of the Year award’? The most exciting thing about being nominated for a museum award is that it is timeless – the Museum’s ad campaign says it perfectly: Someday, other museums will be showing this stuff. And particularly by the British Design museum in London. London is such an innovative, stylish city so it’s really special to be selected for nomination here. 2.What sets the Obree apart from other e-bikes? The Obree is part of a range of A2B e-bikes that are designed to have a very unique, clean and clear design language. Since 2008, when we designed the first true e-bike for the A2B range, the intention was to create a mode of transportation in its own class, so not just adding a battery on a bicycle, which would seriously hinder the design, stability and look of the product.Six years on, the Obree is one of a new generation of e-bikes. It has a much more stream-lined look and is lighter in weight. This was achieved by using new manufacturing methods and detailed work on the frame. For example, we produced a new seat mast through a process called hydroforming that enabled us to produce the seat mast in just one piece. We have also made adjustments to the system and components. 3.What inspired these new generation e-bikes? using new design techniques to improve weight, stability and look.In the future, as battery technology gets much more efficient, this will continue to inspire the innovation of this new vehicle class. 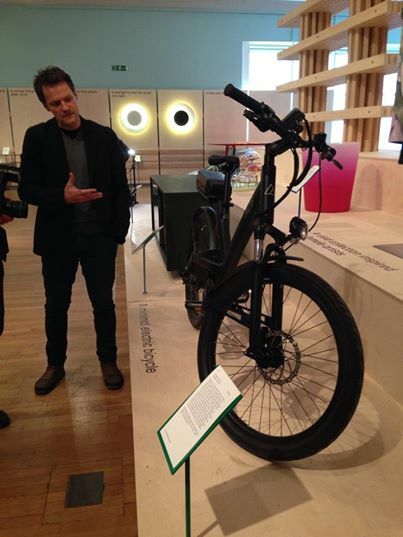 4.What do you think motivates people to use e-bikes? s a lot more traffic. So size and cost of transportation are bigger issues. made ones. Greener, more sustainable vehicles also have a much better image these days, they are better designed, better understood and so are considered to be much more fashionable. 5.Do e-bikes have a big future? Electric vehicles have a fantastic future! Large car manufacturers are investing heavily in electric vehicles. They strongly believe they are the future – they are cheaper to run, particularly as fuel prices continue to rise, and much quicker around busy urban areas. A number of cities, such as Paris and in San Francisco, where A2B e-bikes are part of the City Share car scheme, have already set up rental schemes for electric cars and or e-bikes.As more and more countries continue to urbanise, and the population continues to expand, e-bikes will become a stronger part of the electric vehicle mix because they are small, nimble and hugely cost effective. E-bikes are definitely here to stay.